This weekend will be different than any weekends of the past 9 months. I'll be spending this weekend alone... no baby and no husband. I don't actually need a break from my husband, just the baby. But someone's got to stay with the baby and my husband has volunteered! I'm going all the way to Berkeley, just across the Bay! Chris asked if that was far enough and I said as long as I can't hear the baby crying, it's far enough. So Berkeley it is! And I'm taking BART, too. I have recommended the joie de vivre hotels to a few friends, but have never actually stayed there. 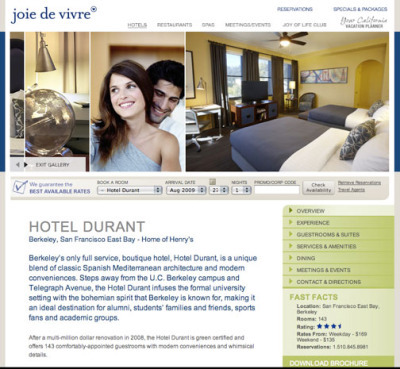 I'm excited to try Hotel Durant, near the UC Berkeley campus. You can't drag photos of their site, so I'm giving you a screenshot. Rest assured, I'll take photos and post them. I'm insanely excited about sleeping a lot and eating my meals slowly.